University of Arkansas researchers are studying the lakeshore processes at one of America’s most beloved national parks to help tease out how the lake’s ups and downs reflect the movement of a living volcano. The day probably started like any other – birds singing in the trees under blue skies, or perhaps it was rainy. The first sign might have been rumbling, a tremor from the not-so-distant belly of the earth. Or the signal might have come from an ash cloud, spewing dark debris skyward. Then, with little outward warning, the ground exploded, shooting boiling clouds of ash and pumice miles into the sky. By the time the cataclysm ended, over 600 cubic miles of material had ejected from the ground into the air, and layers of ash had fallen thousands of miles away, making Mt. St. Helens look like a polite sneeze in comparison. 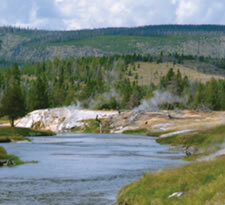 Every year about three million people go to Yellowstone National Park to see remnants of these violent eruptions. Geologists have found evidence of several major eruptive episodes – the first 2.2-2.1 million years ago, the second around 1.3 million years ago and the third about 640,000 years ago. Indeed, the West Thumb Arm of Yellowstone Lake was created by a relatively minor explosion about 150,000 years ago. Visitors to today’s Yellowstone National Park wander about within a living caldera, a modern-day volcano simmering away beneath the surface. Yellowstone sits upon a “hot spot,” one of about three dozen situated at various points on Earth — a place where the crust has thinned so that hot magma lies close to the surface, at points only an estimated 10,000 feet below the ground. The hot spot is responsible for the cataclysmic eruptions in the past 2 million years – a blink of an eye geologically speaking. The gushing geysers, funky-sounding fumaroles, colorful pools and quirky mud pots that attract tourists to Yellowstone are the outward signs of the magma’s continuing presence. Geologists monitor two domes inside the Yellowstone caldera that seem to swell and shrink over time. Researchers want to better understand the underlying processes of the Yellowstone caldera because doing so will help scientists understand volcanoes in general and may one day help save lives. 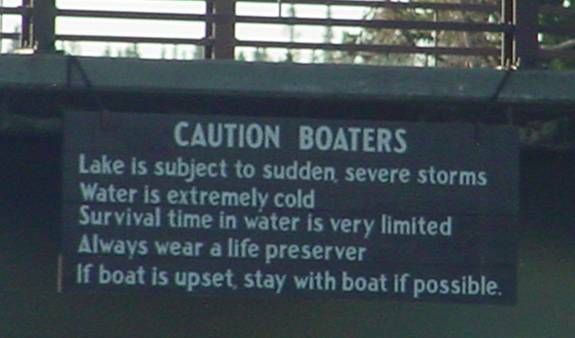 And it turns out that in Yellowstone, the lake may have something to say about all this. It is a clear August morning in Yellowstone. A pelican glides past the Grant Village marina at the south end of West Thumb Arm of Yellowstone Lake. The sun’s silvery reflection glints off of the water and hits the bright white side of the Research Vessel Ozark Explorer, a 22 x 12-foot Sedan Cruiser that Boss and his graduate students hauled on a trailer behind a white van from Arkansas to Yellowstone. Boss, with doctoral students John Dennis and Mo Salem and undergraduate student Vanessa Heil-Chapdelaine, a Research Experience for Undergraduates student visiting the University of Arkansas for the summer from Washington University in St. Louis, camped for four days on their way to Yellowstone National Park. Once in the park, the UA crew met up with Barbara Pickup, Distinguished Doctoral Fellow in the environmental dynamics program and 2004 Canon National Parks Science Scholar. 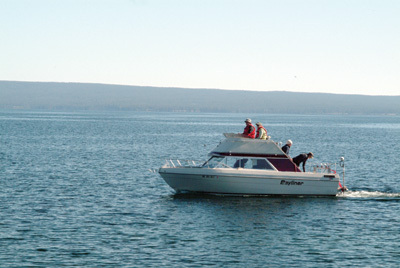 Boss steers the boat to the dock as Pickup and Dennis assist two rangers from Yellowstone’s research permitting office off of the boat. They have been on the water since 6:30 a.m., and it is now 9 a.m. As we take the rangers’ places, Dennis hands each of us – me, my son and my mother — a life jacket much like the bright orange one he wears. “The water’s real cold, now, so don’t fall off the boat,” he says. Later, as we glide across the West Thumb Arm at five miles per hour, Boss elaborates a little on that statement. “The park rangers told us that if you fall in and you stay with the boat, you’ll be dead in 20 minutes, and if you fall in and try to swim for shore, you’ll be dead in 20 minutes, so don’t fall in,” he says. Yellowstone Lake is the largest natural freshwater lake in the United States above 7,000 feet and is one of the largest such lakes in the world. The lake covers 136 square miles, is 20 miles long by 14 miles wide and it has 110 miles of shoreline. It is at least 390 feet deep in the West Thumb area and has an average depth of 140 feet. Because of its size and depth and the area’s prevailing winds, the lake can sometimes be whipped into a tempestuous inland ocean. The lake remains cold year-round, with an average temperature of 41 degrees Fahrenheit. Research at Yellowstone is not for the faint hearted. While in the park, the scientists had to work around bad weather – including hailstorms and flash floods – encounters with bears, illness and occasional equipment failure. They also put in long working hours. They had a lot to accomplish in the two-week window in Yellowstone, so there were no weekends or holidays. The work on the boat held its own risks, and Boss emphasized that safety always comes first – at the first sign of wind, rain or choppy water, they would get off of the lake. The research on land often meant working on the shoulder of a narrow road where people are paying attention to wildlife and the scenery, so the whole crew wore bright orange mesh vests so they could be easily seen. The researchers also had to clamber over boulders in the large chunks of rock called “rip-rap” on the side of the road, which is hard on ankles and knees – one misstep could send an unlucky person to the nearest medical facility with a sprained ankle. But in the West Thumb Basin of Yellowstone Lake on a clear sunny day, with the sun’s mirror-like reflections on the water, all is calm as we work. In the boat’s cabin, black lines snake across the screen of a laptop computer, moving slowly up and down, occasionally splitting into layers, then coming together to form one fuzzy black mark. The computer is recording sound waves as they are bounced off the lake floor from a dual-frequency echo sounder, which is coupled with a GPS antenna to determine the exact location of the depth sounding. The researchers use both high and low frequency sound waves to determine different things: The high frequency sound waves show sediment lying atop the actual lake bottom, while low-frequency sound waves penetrate lake sediments and depict the lake bottom beneath the sediment. The equipment takes readings of the sound waves about every five feet or so, and each reading has a GPS point attached to it. By scanning across the lake from east to west then north to south, the researchers create a grid of points and depths that allows them to create a detailed digital elevation model of the bottom of the bay – essentially a detailed topographic map of the lake bed. At the helm, Boss glances occasionally at a small digital screen that contains data from the GPS unit. The screen shows where the boat has already been, “a little trail of breadcrumbs” according to Dennis. That allows them to be sure they are not duplicating data points. The U.S. Geological Survey has mapped the entire lake bottom, but Boss and his students are creating a more detailed model of selected areas. They plan to combine the information gathered about the lake bed and the lake shore to create a digital simulation of these areas of the West Thumb Arm. Then they will use computer modeling to mimic different types of deformation and sediment movement to see if changes they see in the digital model parallel those they see along the actual lake bed and shoreline. They can then compare what they have created through simulation with historic aerial photos. “The trick for us is trying to reconstruct events to match the lakeshore documented on historic aerial photos,” Boss said. If successful at linking caldera deformation, lake level and shoreline change, this method could greatly help National Park Service personnel and other researchers track caldera movement, because the lake shore changes annually by magnitudes of meters, whereas the caldera changes in centimeters. “It’s potentially another way to monitor what the caldera is doing through the lake shore,” Boss said. Like so many visitors before him, geosciences professor Boss had returned to Yellowstone as an adult for a family vacation with his children in 2003. On this visit, however, something caught his eye that he hadn’t noticed before. He saw that the shoreline of Yellowstone Lake had beaches and sand spits – much like the Atlantic coast he had studied a decade before. Boss wondered if anyone had ever studied the shoreline processes along Yellowstone Lake, so he contacted the National Park Service and found out that no one had. “It’s the boundary between the lake and the land that was ignored,” Boss said. After that visit, Boss and Barbara Pickup, a distinguished doctoral fellow in the environmental dynamics program, began to gather historical photos of segments of the lakeshore along the West Thumb Arm. They chose this particular part of the lakeshore in part because it lies in an inhabited area of the park, and the U.S. Geological Survey and National Park Service had historical photographs of this area of the lakeshore that could be compared to modern-day aerial views. In 2004, Pickup examined aerial photographs taken from 1954 to 2002 to study shoreline changes. One photo, taken in 1994, had been geographically corrected using Geographic Information Systems to pinpoint the exact location of each pixel, and Pickup used this photograph to calibrate the other photos. She then measured the shoreline in 20-meter intervals to determine the net change from photo to photo. When she and Boss examined the data, they found that overall the shoreline had receded. However, they also found something unexpected. “We saw a substantial change along the shoreline, and it wasn’t uniform around the basin,” Pickup said. Normally, a lake shoreline would advance or recede much like the water in a bathtub – evenly around the whole tub. However, the data from Pickup’s study showed one side of the basin receding while other parts remained stable or advanced – and later the processes reversed. 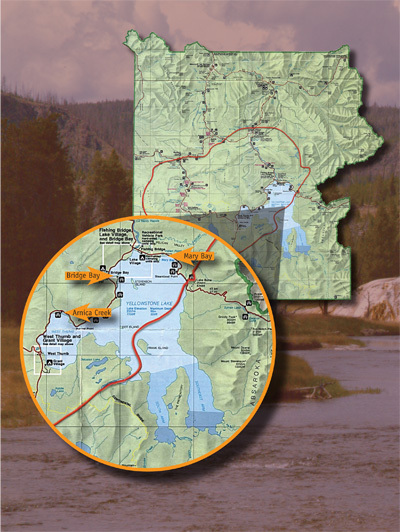 The West Thumb basin and most of Yellowstone Lake sit within the Yellowstone Caldera, the actively deforming crater formed by the violent volcanic eruptions of the past. The lakeshore changes might reflect changes in the caldera Boss said. However, other processes such as variation in lake level or redistribution of sediment along the lakeshore could be responsible for the lakeshore changes, too. Determining which combination of these factors causes the shoreline to change is the focus of Pickup’s dissertation. The National Park Service has an interest in better understanding shoreline erosion for several reasons: First, because it may affect archeological sites along the lakeshore and a rare, endangered flowering plant found nowhere else in the world, and second because it may affect infrastructure built alongside the lake, such as roads. “The lake has been used by humans for 10,000 years and continues to be a popular spot for present-day tourists,” Pickup said. This year marks the second summer that Pickup has spent in the park. Last summer, she and Boss used high-resolution computer equipment to scan and measure the shoreline studied in the aerial photographs at three sites in the West Thumb basin. This year, they returned to the same sites to perform scans again. Pickup received a fellowship from the Canon National Parks Science Scholars Program to fund her dissertation. With the scans from last summer and this summer, the researchers hope to determine what changes have taken place over the course of one year. In addition to hitching the boat to the back of the van, the research team hauled along a mass of on-the-ground equipment to use for making detailed maps of the lakeshore. They brought along the High Accuracy/Resolution Landscape and Structure Characterization System, better known as HARLS-CS – an integrated suite of high-technology laser scanning devices housed in the Center for Advanced Spatial Technologies (CAST). HARLS-CS was used to create detailed images from the edge of the lakeshore to the top of the bluffs lining the shore. For her research, Pickup is looking at three sites in the West Thumb arm of the lake: Osprey Beach, among the oldest known archaeological sites within the park; and East and West Arnica, named for Arnica Creek, which runs into a lagoon on the north side of West Thumb. Pickup and environmental dynamics graduate student Mo Salem set up two tripods, one for the laser scanner and the other for GPS, to pinpoint the exact location of each image. Then Salem calibrates the laser profiler using GPS and sets up a scan that will create three-dimensional images of every rock, every tree branch and every pile of dirt. The scans reveal detail down to about a centimeter – enough to determine if the lakeshore has receded or advanced, or if there have been landslides and erosion,. As Pickup, Salem and Boss worked in the park last summer, Boss noticed that some of the roads along Yellowstone Lake hugged the shoreline and were supported by rip-rap – large stones brought in to shore up the road against lake erosion. This year, environmental dynamics graduate student John C. Dennis began work on yet another project at Yellowstone Lake – using GPS and other scanning and mapping technologies to determine changes in the erosion processes when the natural shoreline is replaced with rip-rap. At some locations, the road runs adjacent to the water, with rip-rap starting less than 10 feet form the shoreline. At other locations, the rip-rap is the shoreline. One morning illustrated the unexpected issues that field research presents. As the van stopped at the first survey location, someone spotted a brown dot lumbering down a hill until it finally became a bear. The bear zig-zagged down the hill until it was relatively close, a huge group of cars began to slow down or stop, and people began pouring out of them to gawk and take pictures. It is not wise to turn your back on a bear, so after determining that the bear wasn’t going to go away, the researchers moved the van a mile or so to another pull-out and began to unload equipment. While they were doing so, Pickup called a park ranger to report the “bear jam,” which was causing traffic problems. All the researchers put on bright orange mesh vests to alert cars to their presence. As they set up the equipment, another problem arose: The memory card used to record data from the GPS unit was not recording properly. Despite this setback, they were able to continue to gather data – they just couldn’t have the computer do all the calculations for them. This meant the researchers had to take down the GPS coordinates individually and do some of the calculations by hand using trigonometry to be sure they were correct. Dennis and Salem used a laser range finder to map the location of the rip-rap. Then Dennis donned an insulated wet suit and hauled a large pole with what looked like a silver pizza pan out into the water. The range finder shoots a laser like a gun at the pizza pan reflector. By pinpointing the exact location of the reflector, the distance and height of the reflector can be calculated. From this information, the researchers can determine the slope of the beach, the rip-rap and the slope of the lake bed just off shore. “We want to see if the road engineering is influencing how the beaches and the lake bed are evolving,” Dennis said. Natural beaches usually have a gradual slope to the shoreline, which allows waves to dissipate energy when they come ashore. However, when waves reflect of the rip-rap, they don’t lose much energy, and may scour out and deepen the lake bed just off shore, changing the nature of the shoreline and causing it to erode, Boss said. If the shore erodes, then more rip-rap will be needed, taking the lakeshore further away from its natural state. “Then the reason that you created access to the lake isn’t there anymore,” Boss said. The researchers plan to compare the lakeshore processes at shores with rip-rap to the lakeshore processes at undisturbed beaches to see what kind of impact the road may be having on the shoreline. “It’s something the park service will constantly have to deal with,” Dennis said. The National Park Service has a two-fold mission, both to be responsible stewards of the natural resources in Yellowstone and to ensure the public enjoyment of those natural resources. Knowing how man-made structures will affect the natural resources and knowledge about the historical processes of the caldera offer the Park Service more pieces of information that they can use to make informed decisions that affect the park’s future.